Preparing for the 6th. annual IoT & Built Environment MeetUp, this year on Art & Imagination. 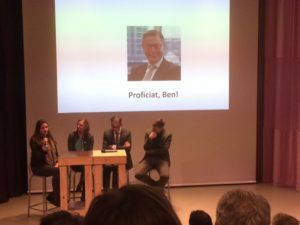 Once again on April 9 (WW-IoT.day) in V2, the Institute for the Unstable Media in Rotterdam; speakers confirmed so far: Yvonne Droge Wendel (Rietveld Acad. ), Ben van Lier (Centric), Usman Haque (Thingful) , Florian Hellwig (Urland) , Frans Vogelaar & Elizabeth Sikiaridi (hybridspacelab Berlin) Delfina Fantini van Ditmar (RCA) . Introduction Rob van Kranenburg, moderator Leon van Geest. More info on program and other speakers soon to come…. Last April 22 I was invited/part of a small group to view the preparations at the Rotterdam Theatre for the 3rd. theatrical production by Urland, a Dutch performance group which has already produced two earlier thematic projects with the role of technology/iot as basics. This 3rd. 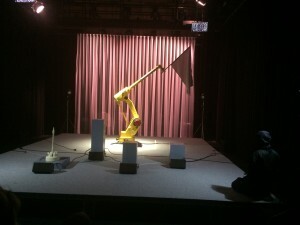 production contemplates the role of objects and their relation to technology, in part (re)viewed by a most elegant acting industrial robot-arm. 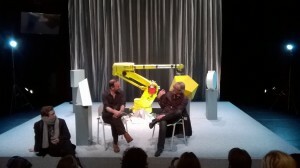 Afterwards we had a most interesting discussion concerning technology and theatre in general, but in particular their views on IoT and the relevant philosophy. Their approach and the theatrical results so far make me very curious to an interesting final performance scheduled for September 2016. Last Saturday, on WW-IoT-day April 9 we experienced a most inspiring and thoughtful event at V2 with the participation of 5 fine speakers: Rob van Kranenburg about the balance between objects and processes, Linda Kool about Intimate technology and the recent privacy report, Ben van Lier about the 4th.Industrial Revolution, Justin McKeown about the need for human initiative and values, Gerd Kortuem about data-literacy; all building on Jurgen Wege’s notes at the beginning and moderated by Leon van Geest. 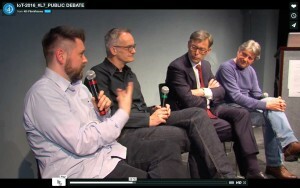 A debate on the autonomy of objects, the importance of human values, the need for an ethical discussion as well as data-literacy.